If the central heating radiators do not seem to be heating the house efficiently, inspect each radiator to discover which is hot and which is cold. If you find a radiator that is cold at the top but warm elsewhere, this is usually an indication that air is trapped in the upper part of the radiator. To resolve this problem you will need to bleed the radiator using a bleed key. 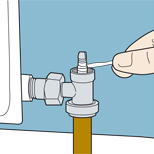 Hold a cloth under the bleed valve situated at one end of the radiator and use the bleed key to open up the valve, without removing it completely. Air will be expelled from the vent followed by water. Use a cloth to soak up the water. When water appears close the vent with the key. Do the same with any other problem radiators and then turn the central heating back on. If this problem occurs again and you need to bleed the radiator more than once a year, this indicates that air is entering the system, which will eventually cause corrosion. 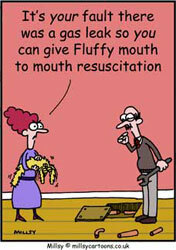 For this problem you are advised to seek professional help from a plumber. 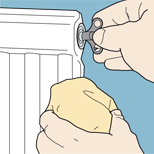 Hold a cloth under the bleed valve and use the bleed key to open up the valve, without removing it completely. A pinhole leak producing a small jet of water is caused by corrosion inside the radiator. Although pouring a plastic resin sealant into the feed-and-expansion tank can achieve a temporary repair, this is usually only a short-term measure. You must not use this type of sealant in a sealed central heating system. For this type of system you will need to replace the radiator. Drain the system down to below the point of the leaking pipe. 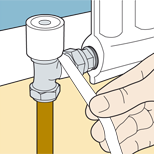 With a spanner undo the nut at the leaking pipe joint and pull the pipe free. Where the face of the olive meets the joint, wrap two or three turns of PTFE tape, and then re-tighten the nut. To repair a leaking valve drain down the system to below the leak. Turn off both the supply valve and the lockshield valve, remembering how many turns it takes to close the lockshield valve. Position a bowl and towels under the leaking valve to catch any water remaining in the system. With an adjustable spanner undo the union nut, turning it in an anti-clockwise direction (this is when looking towards the valve from the radiator). Opening the bleed valve will cause the rest of the water to empty from the radiator into the bowl. Starting at the end of the male thread of the valve tail, tightly wrap it with PTFE tape overlapping each turn by 50%. Re-tighten the union screw and open the bleed valve, supply and lockshield valves, remembering only to make the same number of turns on the lockshield valve as you used to close it. When the water is restored to the system, check for any leaks and then close the bleed valve. Starting at the end of the male thread of the valve tail, tightly wrap it with PTFE tape. A leaking bleed valve or air vent is easily repaired. Drain the system to below the bleed valve. Using a radiator spanner remove the bleed valve. Wrap PTFE tape around the screw joint at the base of the bleed valve and screw back into position. If water is leaking from under the plastic cap, the packing gland needs replacing. This can be done using PTFE tape. Turn off the valve. If water is still leaking from under the plastic cap you will need to turn off the lockshield valve at the other end of the radiator. Remove the plastic cap and unscrew the gland nut. Stretch a length of PTFE tape into a string, then wrap it around the spindle four or five times. With the blade of a small screwdriver force the tape into valve body. Apply silicone grease to the tape and screw the gland nut back on tight. Replace the plastic cap and turn the valve back on. Stretch a length of PTFE tape into a string, then wrap it around the spindle four or five times. If the drain valve is leaking, its washer probably needs replacing but you will need to drain the system to repair it. Once the system has been drained remove the spindle from the drain valve by unscrewing it with a spanner. On the end of the spindle you will find the worn washer. Remove it and replace it with a fibre washer. Avoid using rubber washers as they can bake in the hot temperature and perish. Replace the spindle and refill the central heating system.